Forklifts cause hundreds of accidents every year that result in injury or death. While it may not look much more complicated than driving a vehicle, operating a forklift comes with its own unique practices and hazards. Two of the most common dangers associated with forklifts that lead to accidents are unsafe traveling maneuvers and driving too fast. When there are other workers around who may be distracted and thousands of pounds of warehouse materials, a forklift operator can’t afford to neglect these top safety concerns and operator fundamentals. According to a study led by the Occupational Safety and Health Administration (OSHA), tip-overs are the leading cause of accidents involving forklifts. And the most common causes of tip overs involve speeding, mechanical problems, traveling with an elevated load, incorrect traveling distance between forklifts, making too sharp of a turn, operating on a slippery surface, and the forklift being struck by another vehicle. In many accidents involving forklifts, both the operator and on-foot workers are harmed. There are about 85 forklift fatalities and 34,900 serious injuries that occur every year, and the root cause for many of them is a lack of forklift safety training. The most effective way to prevent all kinds of forklift accidents is to receive safety training and to complete a forklift certification that covers the most important operating protocols. 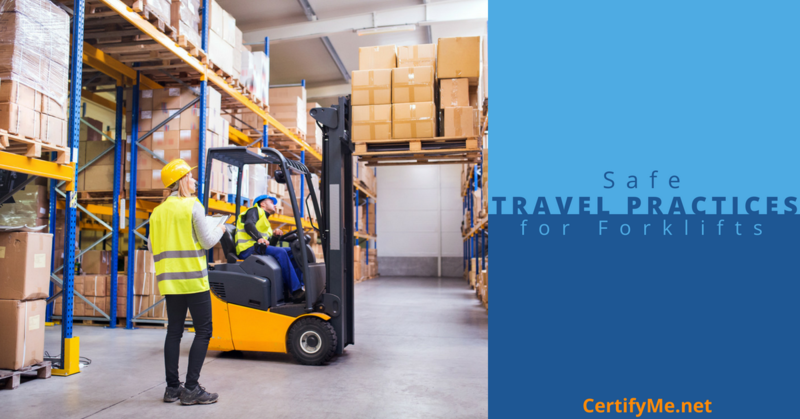 All forklift operators need to be certified to drive forklifts and need to practice the following protocols when traveling with the forklift in a warehouse or construction site. When workers understand how to maneuver the forklift properly, as well as the correct traveling distance between forklifts, they can help prevent the most common and deadly accidents associated with forklifts: tip overs, being struck by a falling load, being struck or crushed by a forklift, and collisions with objects or other forklifts. If you would like to learn how to prevent these accidents, follow these tips from OSHA. Not only do workers need to understand the right techniques for driving forklifts correctly and safely but they also need to understand the importance of traveling at the right speed. Driving too fast can cause the forklift operator to lose control, especially if the traveling distance between forklifts is insufficient, which can lead to tip overs, striking objects or other forklifts, and pinning or crushing pedestrian workers. Blind spots and intersections are located throughout a typical warehouse and operating at a careful, appropriate speed is imperative to navigating these areas safely. Follow these tips from OSHA for traveling at speeds if you want to protect your life and the lives of your fellow employees. What is the Correct Distance Between Traveling Forklifts? The safe traveling distance between forklifts is approximately three truck lengths, or about a time lapse of three seconds when passing the same point. More specifically, it’s about 20 feet between forklifts. The three-second rule is the same for automobiles on the road and is just as important for forklifts. In a busy workplace like a warehouse, sight limitations and loud noises may prevent an operator from noticing everything around them, which increases the risk of accidents. Driving at a safe speed, and using the three-second rule as the travel distance between forklifts, will help forklift drivers prevent collisions with other operators and be able to break in time for a hazard or accident, without causing the forklift to become unstable. Forklifts have a very high center of gravity and can become unstable when traveling at excessive speeds, or when traveling too close to other forklifts and are unable to break properly for an emergency stop. An unstable forklift is a serious hazard risk for accidents and can damage the equipment and any nearby objects if the forklift collides with a structure in the facility. While the three-second travel distance between forklifts may seem to decrease productivity and slow down operations, it can actually save employers thousands of dollars in avoided damages and repairs, as well as worker compensation costs. When all forklifts can remain in rotation and are working safely, the workplace is the most efficient. Traveling too fast on a forklift or too close to another driver can have serious consequences. The forklift is at a much higher risk of toppling over, or colliding with other operators or on-foot workers. According to OSHA, forklift overturns are the most common type of fatal accident involving forklifts. A forklift hitting something is second, and a worker being pinned between objects, including a forklift, is third. As you can guess, a forklift traveling too fast can cause any of these three fatal accidents. A forklift traveling less than 20 feet, or 3-seconds away from other forklifts traveling in the same direction can impair the operator’s ability to stop in time and prevent a serious accident. This is the case when driving down a straight pathway, but especially so when turning around corners and crossing intersections and blind spots. To avoid accidents when traveling with a forklift, always look in all directions before moving, and do not pass other forklifts traveling in the same direction at intersections, blind spots, or other hazardous locations. To learn all of the essential safety protocols for maneuvering and traveling at speeds on forklifts, including the correct traveling distance between forklifts, you need to complete a comprehensive forklift certification. This training will provide you with the information you need to prevent accidents, recognize and avoid hazards, and protect your life. You will learn the fundamentals illustrated above, among others, and will complete a hands-on practical training with an experienced operator. Remember, many past forklift injuries and fatalities were ultimately caused by an untrained worker. Make education a priority and complete OSHA-compliant forklift training with the top online certification platform, CertifyMe.net. Our program only takes about an hour and can be completed 24/7 from any device that has internet. Read more about it below and sign up today! Students will learn everything they need to know to operate all types of forklifts properly, including how to maintain safe speeds, the correct traveling distance between forklifts, and how to avoid collisions with other trucks and on-foot workers. Keep your workplace safe and increase your productivity and bottom line with the forklift certification program from CertifyMe.net!